Going into this issue knowing regular series artist Javier Rodriguez would not be drawing it, I was expecting myself to enjoying this issue of Spider-Woman a little less than usual. Nothing against guest artist Natacha Bustos, but the shadow Rodriguez casts on this book is MASSIVE, and it’s a hard to follow. However, most of my issues with #10 aren’t with Bustos. She kills it with this issue, channeling Rodriguez while giving the book a softer, more manga-influenced look. Natacha never gives us any crazy, hyperactive layouts we’ve gotten in the past, but she does a fine enough job with the issue. It’s a shame that Vero Gandinis color pallet is so pale, otherwise I would have zero complaints with the art. Sadly, aside from his beautiful night skies, his use of light colors irk me, making the final product look cheaper. I was willing to chalk it up to a printing error, but after looking at the digital copy, it’s definitely the shade. The day scenes are well lite enough, but it takes away from the night time scene. My other issue with this comic was it being forced into being a Secret Wars: Last Days tie-in. 1/4 of the book is spent setting up Jessica’s appearance in Secret War #1, and it feels so forced, with an overly aggressive Black Widow that’s incredibly unlikable. It’s rare to see writer Dennis Hopeless slip up like this, but given how poor the Spider-Verse stuff was handled, it doesn’t come as a surprise. The book is at it’s best when it’s dealing with the A plot, which involves such greatness as HULK CATTLE and the Porcupine going full O.M.A.C. (Happy birthday Jack Kirby! ), and could have used five more pages of that then lining up the events of a 4 month old comic. Nothing says 90s X-men like X-Force. The New Mutants went from being the 2nd X-men book to being a sales juggernauts, launching the careers of both Rob Liefield and Greg Capullo, and introducing Marvel icons like Cable and Deadpool. It comes as no surprise that Sims and Bowers decided to use these characters for this title, and the results of pretty great. X-Men ’92 #3 collects the 5th and 6th installments of the digital version of X-Men ’92, which are both the best and worst chapters of this series so far. The first half of this book sees X-Force off to save the captive X-men, all while Casanova Nova finds herself struggling against the combined might of Cyclops and Jean Grey. The 2nd of the half explains Casanova’s end game, ties the book back to Secret Wars, and is kind of all over the place. You can tell writers Chad Bowers and Chris Sims are having a blast with this book when their focusing on the characters, which is where is when the book really shines. It’s an extremely fun fiction of sorts, and I wish these two could continue to have their fun instead of having to wrap this thing up so the 616 X-men can pal around with the Inhumans or whatever. Sadly the artist Scott Koblish‘s art isn’t as solid this time around. While he manages to draw some ridiculous guns and pouches this issue, some of the pages feel rush, and the art feels less parody and more cheap 90s licensed merchandise at times. The good more than out weight the bad in X-men ’92 #3. Its an incredibly fun and exciting read that hits a few snags, but is worth the cover price. It’s been a while since we’ve had a light-hearted X-men book on the stands, and hopefully these creators will have a chance to work their magic again after Secret Wars. BROTIP Forbidden Planet Faithful: Don’t get bedbugs. It is the worst thing. Also why yes, my apartment building does have them, however did you figure that out? X-Men ’92 #2 is a delight. 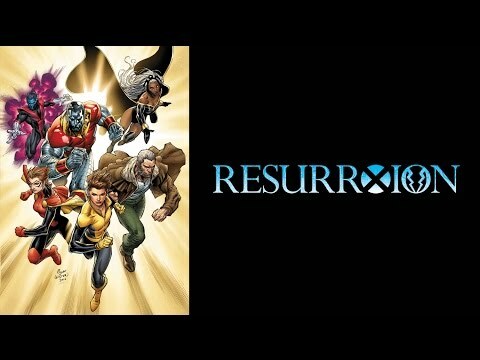 Collecting the 3rd and 4th digital installment of the X-Men 92 Infinity Comics, the X-men find themselves at the mercy of Cassandra Nova, who’s been revised for this tie-in with a completely new origin that involves several classic characters. With the team at her mercy. Nova sets out to make the X-men more “Kids TV friendly”, which means making Wolverine hug it out, cleaning up Gambit and Rogue’s sexual tension and dealing with the likes of Storm and Beast as well, all while Jubilee and a few un-X-pected allies try to save them all. It sounds ridiculous, but it’s all played straight, which only makes the book all the funnier. Cassanova Nova as a literal stand in for US BS & P (That’s TV talk for Broadcast Standards and Practices) is a wonderful gag that’s effortlessly woven into the plot, not requiring the reader to know what sort of ridiculous TV rules the actual X-men 1992 animated series had to adhere to. Artist Scott Koblish is continues to mesh quite well with writers Chad Bowers and Chris Sims, but you definitely get the sense Koblish is trying to out X-geek Chad and Chris at times. While Bowers and Sims make all sort of obscure X-Men reference, Scott’s channeling some iconic moments from X-history, as well as the people behind those books. That being said, it’s also the book’s biggest flaw. Sometimes the book is a little too inside baseball for it’s own good, and casual readers are properly going to be slightly lost at some of the references. BUT, if you’ve been reading the X-books from 1991-roughly 2012, you’re going to be fine. If you’re hoping that this is the issue that ties the story closer to Secret Wars, you’re out of luck, as it only mentions the Thors in passing, and nothing else related to the mega-event. Even with the book deep in in jokes and nostalgia, casual X-fans will find something to enjoy with this issue. Sims and Bowers Wolverine feels like the more iconic version of the character, which makes his fate all the most amusing. Their Storm is over the top, Beasts is a fun genius, Rogue smoldering in generic southern angst, and like I said last time, their Gambit is PEAK scumbag. If whoever is responsible for “It not you it Gambit” doesn’t win some sort of aware in 2016, comics award ceremonies have failed me. Koblish is equally as impressive, telling a fantastic story while sneaking in all sorts of in-jokes and visuals gags. This book is tie in comics at it’s finest: creators who are fans of their source material celebrating it’s rich history, even the more ridiculous stuff. X-Men ’92 continues to be everything I wanted from this sort of book, if not more.